The development and design of a machine is followed by the assembly and commissioning phase. Commissioning is especially time consuming, but the replacement of components or devices can be so as well. This often raises the question of how to simplify commissioning and optimize component replacement. The answer is provided by the IO-Link communication interface. IO-Link is the first globally standardized IO technology (IEC 61131-9) that communicates from the controller down to the lowest level. But how exactly does this help with commissioning and component replacement? This is very simple and will be explained now. Let’s start first with the assembly, installation and commissioning phase. During installation, the individual components must be electrically connected to each other. 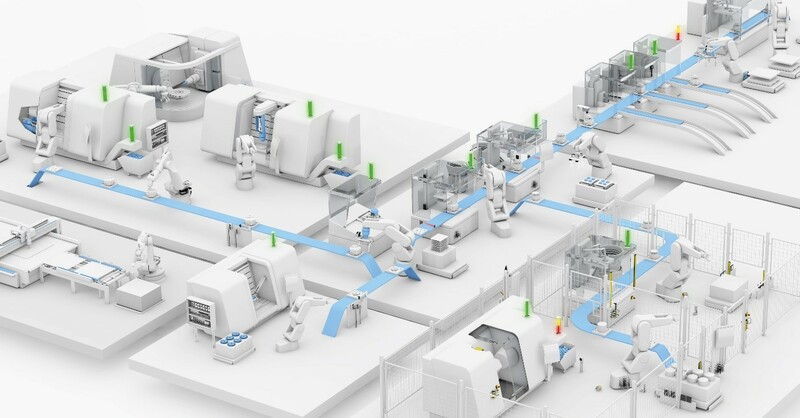 While fieldbus use has simplified the installation process, generally speaking, fieldbus cables have a low signal level, are susceptible to interference, have little flexibility, and are expensive due to their shielding. This is where IO-Link comes into play. 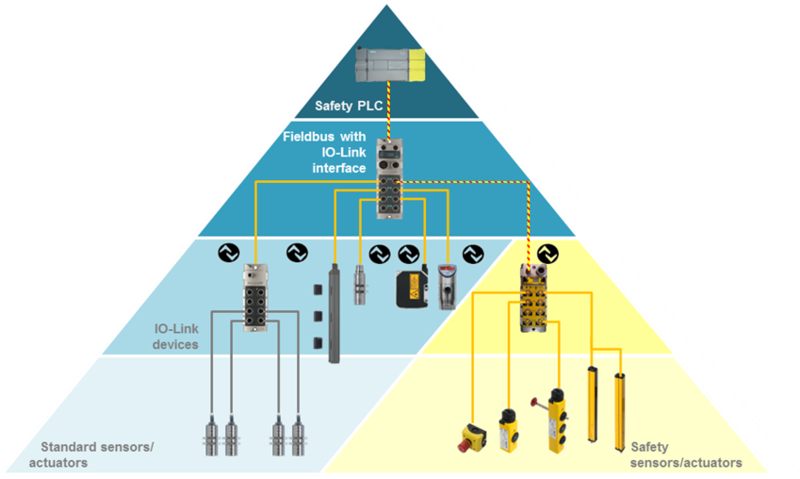 Because the weaknesses of a fieldbus protocol are negligible with IO-Link. Included in an IO-Link system are an IO-Link master and one or several IO-Link devices such as sensors or actuators. 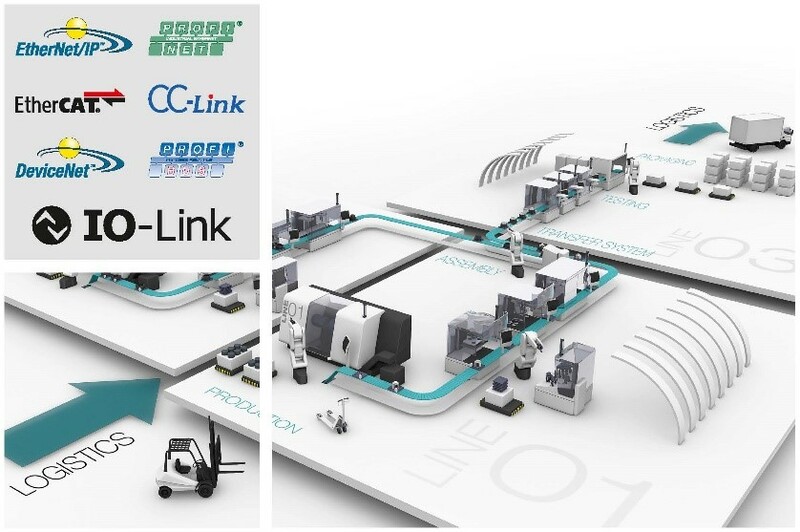 The IO-Link master is the interface to the controller (PLC) and takes over communication with connected IO-Link devices. The interface uses unshielded, three- or four-conductor standard industrial cables. 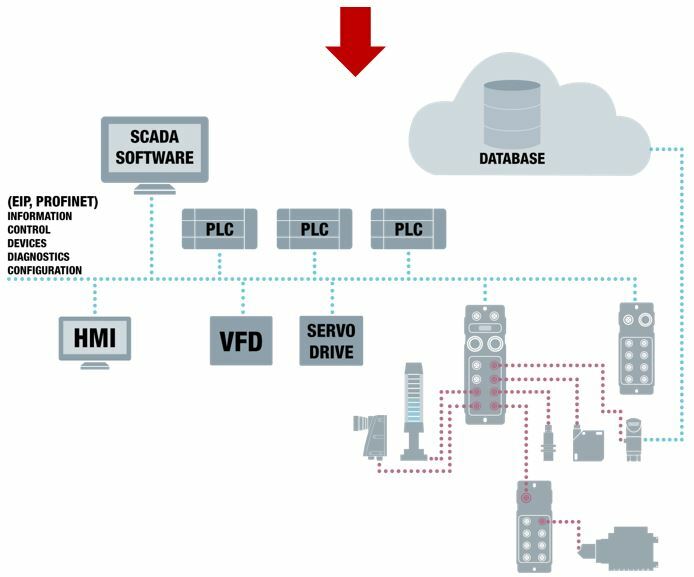 Therefore the standard communication interface can be integrated into the fieldbus world without effort. Even complex components can be easily connected in this way. In addition, the standard industrial cables are highly flexible and suitable for many bending cycles. Three wires are the standard for the communication between the devices and the IO-Link master and for the power supply voltage. These are easy to connect, extremely cost-effective and their connection is standardized with M5, M8 or M12 connectors. The commissioning will also be supported by IO-Link. The devices can be parameterized quickly and easily through parameter maintenance or duplication. 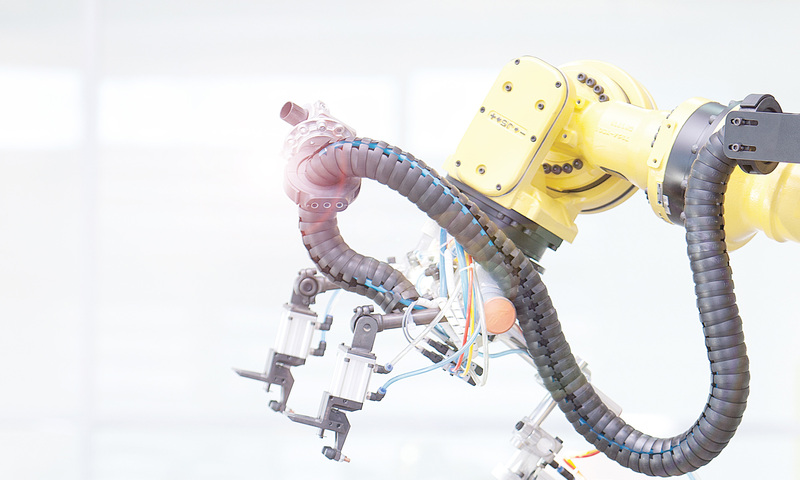 Annoying manual adjustment of the sensors and actuators is no longer necessary. This saves money and avoids errors. 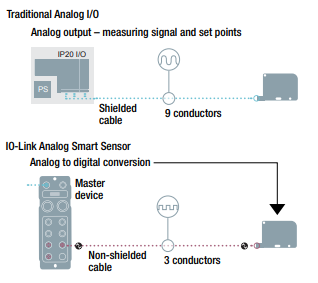 The parameters of the individual devices are stored in the PLC or directly in the IO-Link master and can, therefore, be written directly to the sensor. Now that we have clarified the advantages of IO-Link during commissioning, we will take a look at the replacement of components. 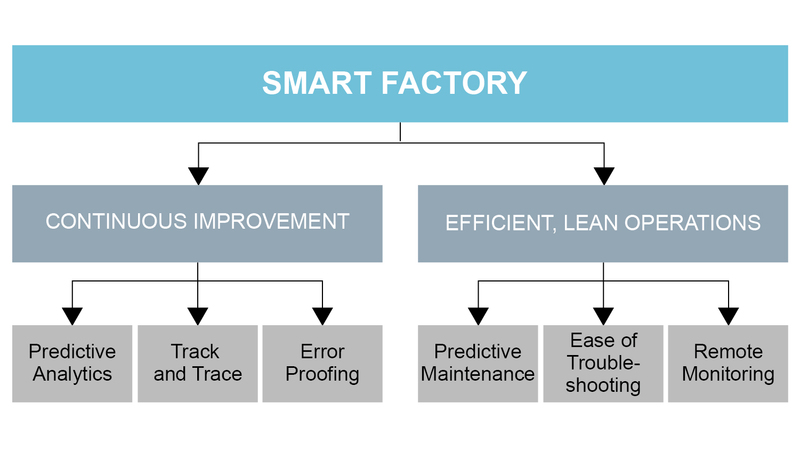 A sensor replacement directly leads to machine downtime. 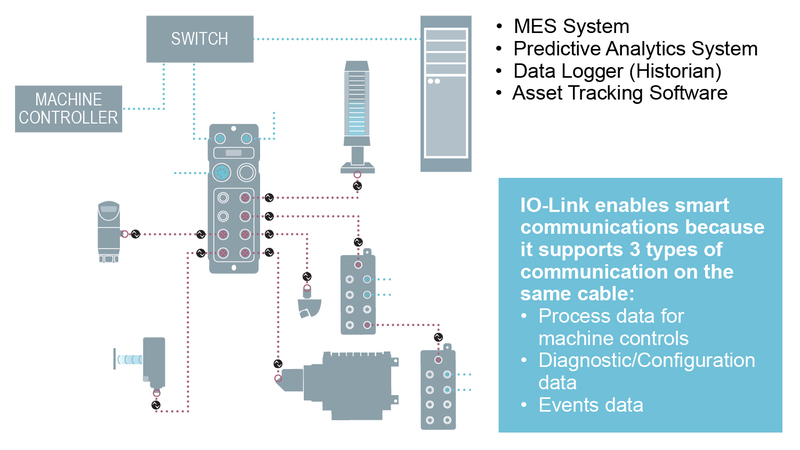 IO-Link enables quick and error-free replacement of sensors. The parameters of a replaced IO-Link sensor are automatically written from the IO-Link master or the PLC to the new sensor. The accessibility of the sensor does not play a major role anymore. In addition, IO-Link devices cannot be mixed up, since they are automatically identifiable via IO-Link. IO-Link offers ideal properties that are predestined for format adjustment: sufficient speed, full access to all parameters, automatic configuration, and absolute transmission of the measured values. This eliminates the need for time-consuming reference runs. Since the machine control remains permanently traceable, the effort required for error-prone written paper documentation is also saved. Format changes and recipe changes can be carried out centrally via the function blocks of the PLC. To learn more about the advantages of IO-Link, visit balluff.us/io-link. IO-Link is well-suited for use in measurement applications that have traditionally used analog (0…10V or 4…20mA) signals. 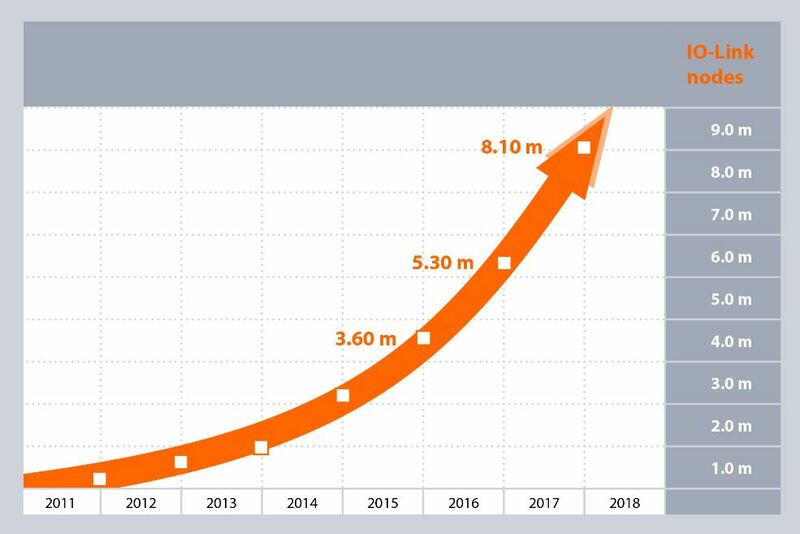 This is thanks in large part to the implementation of IO-Link v1.1, which provides faster data transmission and increased bandwidth compared to v1.0. 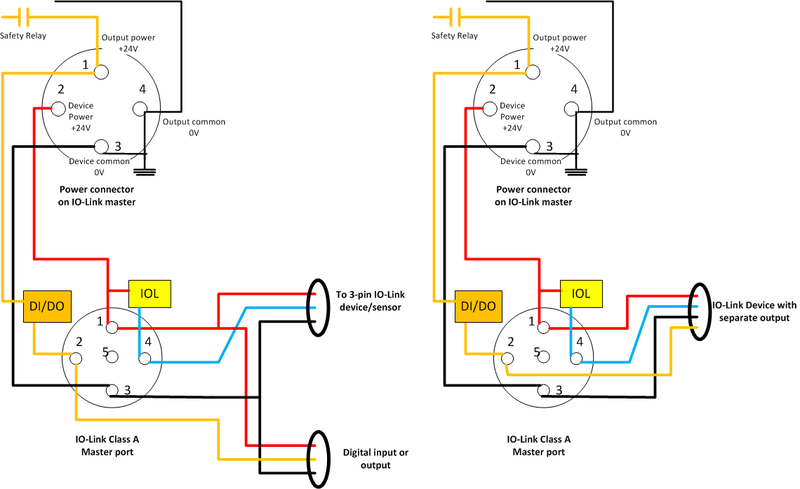 Here are three areas where IO-Link v1.1 excels in comparison to analog. By nature, analog signals are susceptible to interference caused by other electronics in and around the equipment, including motors, pumps, relays, and drives. Because of this, it’s almost always necessary to use high-quality, shielded cables to transmit the signals back to the controller. Shielded cables are expensive and can be difficult to work with. And even with them in place, signal interference is a common issue that is difficult to troubleshoot and resolve. With IO-Link, measurements are converted into digital values at the sensor, before transmission. Compared to analog signals, these digital signals are far less susceptible to interference, even when using unshielded 4-wire cables which cost about half as much as equivalent shielded cables. The sensor and network master block (Ethernet/IP, for example) can be up to 20 meters apart. Using industry-standard connectors, the possibility for wiring errors is virtually eliminated. An analog position sensor expresses a change in position by changing its analog voltage or current output. However, a change of voltage or current does not directly represent a unit of measurement. Additional programming is required to apply a scaling factor to convert the change in voltage or current to a meaningful engineering unit like millimeters or feet. It is often necessary to configure analog sensors when they are being installed, changing the default characteristics to suit the application. This is typically performed at the sensor itself and can be fairly cumbersome. When a sensor needs to be replaced, the custom configuration needs to be repeated for the replacement unit, which can prolong expensive machine downtime. IO-Link sensors can also be custom configured. Like analog sensors, this can be done at the sensor, but configuration and parameterization can also be performed remotely, through the network. After configuration, these custom parameters are stored in the network master block and/or offline. When an IO-Link sensor is replaced, the custom parameter data can be automatically downloaded to the replacement sensor, maximizing machine uptime. A major limitation of traditional analog signals is that they provide process data (position, distance, pressure, etc.) without much detail about the device, the revision, the manufacturer, or fault codes. In fact, a reading of 0 volts in a 0-10VDC interface could mean zero position, or it could mean that the sensor has ceased to function. 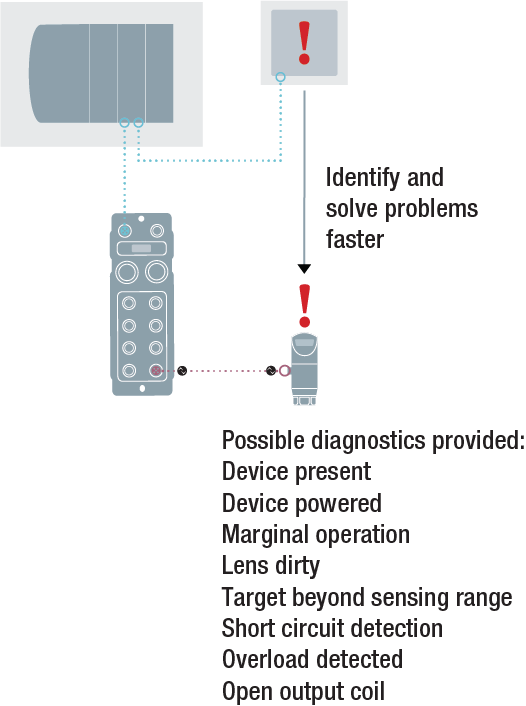 If a sensor has in fact failed, finding the source of the problem can be difficult. With IO-Link, diagnostic information is available that can help resolve issues quickly. As an example, the following diagnostics are available in an IO-Link magnetostrictive linear position sensor: process variable range overrun, measurement range overrun, process variable range underrun, magnet number change, temperature (min and max), and more. This sensor level diagnostic information is automatically transmitted and available to the network, allowing immediate identification of sensor faults without the need for time-consuming troubleshooting to identify the source of the problem. To learn about the variety of IO-Link measurement sensors available, read the Automation Insights post about ways measurement sensors solve common application challenges. For more information about IO-Link and measurement sensors, visit www.balluff.com. 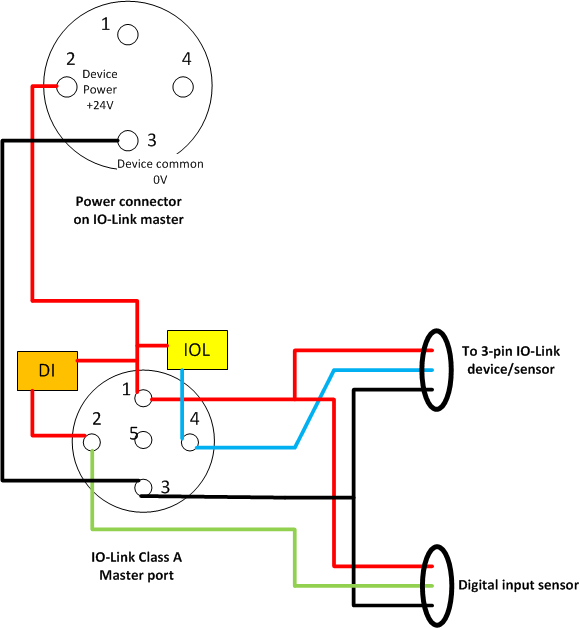 In the first part of this series “Demystifying Class A and Class B Type IO-Link Ports” we discussed the two different types of IO-Link master ports and pointed out how they differ in operation and applications. The point of that blog was to ensure that when we choose one over the other, what is the opportunity cost of that decision. 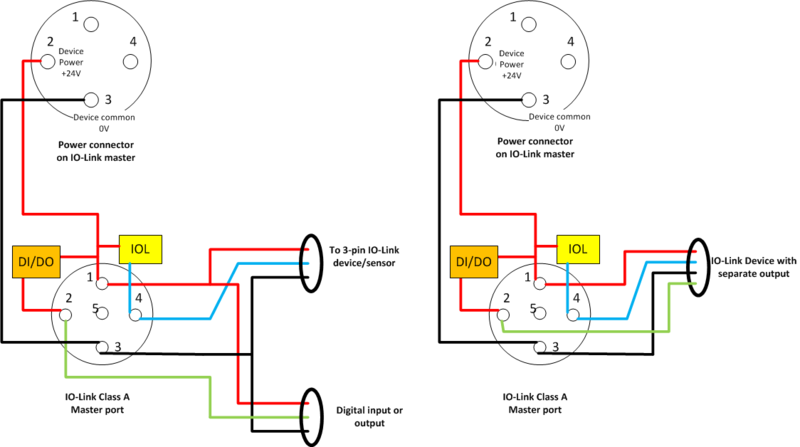 In my recent blog, part #2 in this series, “Not all IO-Link Masters are Born Equal!“, we explored that even when multiple vendors provide or call out their IO-Link master, they are different in the implementation of features and functions they offer. IO-Link is IO-Link! It is a standard for communication but other features that accompany the communication differentiates how they behave; for example- sensor only master, hybrid master, and architecture backbone master. In this blog, we will focus on various implementations of Port Type A (or Class A) and how they add varying degrees of value to your applications. The power coming into the IO-Link master port is only device power. There is no output power with this implementation. The reason that it is designed like this is to only integrate sensor inputs. Pin 1 and Pin 3 provide the device power and ground (common) to the IO-Link device, pin 4 is IO-Link communication. Pin 2 works as an input only for digital sensors like photo-eyes or prox switches. Basically, this port can be split to use one IO-Link sensor (pins 1, 3 and 4) and one standard ON/OFF sensor (pins 1,3, and 2). Another alternate of this implementation is that some vendors may have another IO-Link connection on Pin 2. So, it serves to add 2 IO-Link devices off the same port. Unfortunately, I am not an expert to say whether this is according to the specification or not. The Pros: Low power consumption and simplifies integrating smart sensors. The Cons: By definition, a control system has both inputs and outputs – controlling “something” based on sensory inputs and logic. This implementation provides semi-standard implementation to the controls architecture. 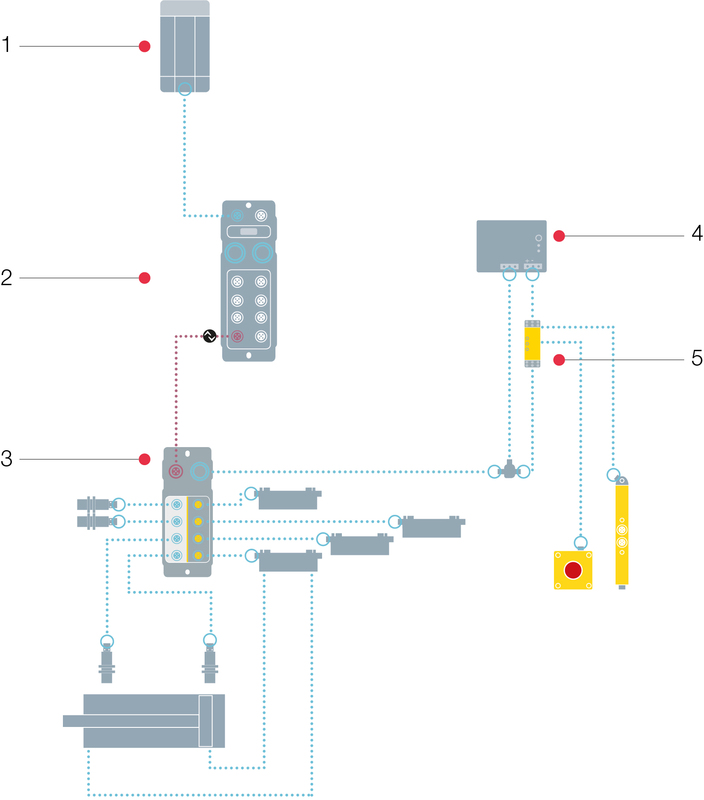 IO-Link promises unified communication across the plant floor not half of the plant floor. Characteristics of this type of master port would be max output current of about 250-300mA per port and about 2A per module (rated for up to 4A, if its carries UL). Implementation #2: This implementation is a slight variation of the sensor only port (Implementation #1 above). It is achieved by adding an output capability for pin 2 on each port- shown in figure 2 below. It is important to note that although each port has output capability on pin 2, the output power is shared with the device power for the port. It implies that, in case of E-stop situations, where shutting off power to the valves/solenoids connected to pin 2 or an IO-Link device that requires an output power, the entire device power will be shut-off. 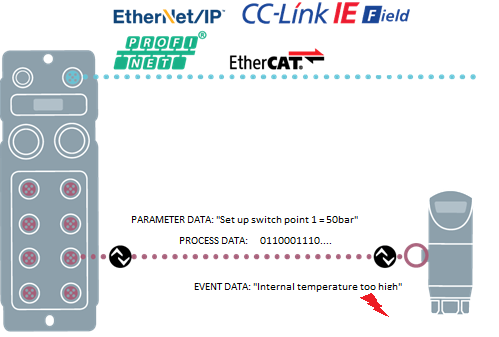 Basically, the state of the device connected to pin 2 and state of IO-Link devices connected on pin 4 will be lost or requires more elaborate approach (programming, testing and validation) in the controls side to handling these types of safety situations. This type of implementation is commonly found on hybrid IO-Link master’s Class A (type A) port implementation. The Pros: Flexibility to use pin 2 for input or output – standardized approach to all devices. The Cons: Lack of ability to control the output power separate from the device power – causing variety of controls approaches (lots of precautions) when incorporating machine safety. Implementation #3: This implementation offers the most flexibility in designing the controls architecture that utilizes IO-Link. Figure 3 depicts the implementation below. In this case, the device power, as prior approaches, comes from pin 1 and pin 3 but pin 2 uses a separate power for output. The pin 2 on each of these ports can be used for input, output or to provide separate output power to the IO-Link devices. It is important to note that although pin 2 offers output power separate from the device power, the common/ground for this power is still tied to pin 3. The output power is separate but not isolated, like in the Class B port implementation discussed in the blog “Demystifying Class A and Class B Type IO-Link Ports“. The two key advantages with this approach are: 1) High amperage output can be used from pin 2 to control valves or solenoids by splitting the port, and 2) IO-Link devices such as valve terminals or configurable I/O hubs that require output power can be connected with standard 4 pole cables without needing additional power cables or connectors. This does appear very similar to implementation 2 where output power can be provided as well. The key difference is that since the output power comes from a different power line, it is not shared with the device power — as you know, amperage reduces when you have parallel circuits, so implementation 2 is subject to that principle whereas implementation #3 is not. Another benefit with this approach is that a safety relay can be placed on the power going to pin 2 because the output power for the entire module is separate. That means in case of E-stop situations, the output power can be shut off without harming the device power. This eliminates the need for elaborated controls planning as the device state is maintained throughout the operation. After recovering from an E-stop, the valves and all other outputs go back to their original state. 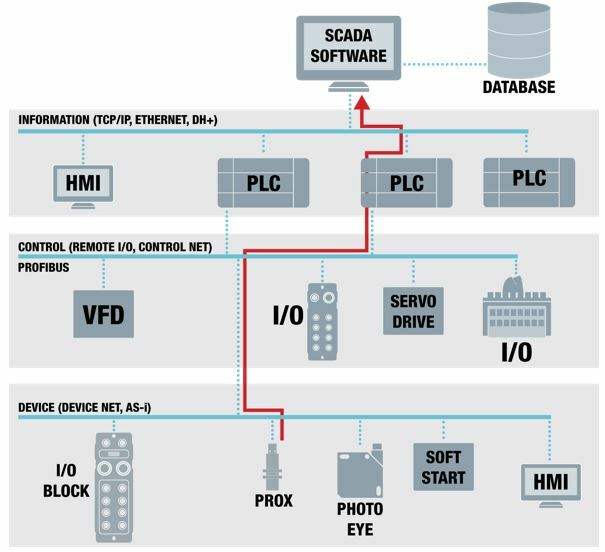 This significantly simplifies your controls architecture, offers standardized approach to cabling and provides unified interface for all devices. To learn more about Balluff’s implementation of IO-Link masters please visit www.balluff.com.